KHOTANG, June 17: Basanta Rai, a teacher at Janata Secondary School, Diprung Rural Municipality-4, Khotang, resigned from his post on April 18 in order to file his candidacy in the local elections. Rai who is a supporter of the Nepali Congress (NC) wanted to contest for the major post of the rural municipality. He lobbied with the local NC leaders for his candidacy till the last moment, but unfortunately he failed to get a ticket. KATHMANDU, Jan 21: The number of Nepal Telecom (NT) subscribers activating the company’s newly-installed fourth generation mobile phone technology system (4G) crossed 40,000 in the first 15 days. NT started offering 4G services for GSM postpaid subscribers on January 1. It is true that the outgoing chief of National Reconstruction Authority (NRA), Sushil Gyewali, had little to show for his year in office. As we have repeatedly written in this space before, there seemed to be a big gulf in Gyewali’s words and actions. 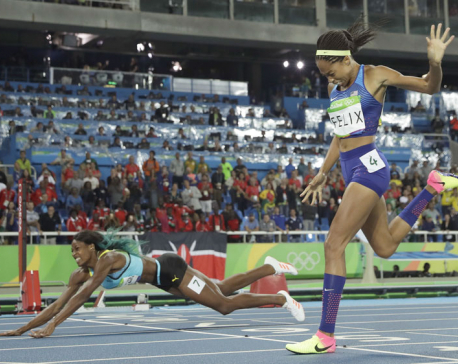 Shaunae Miller looked more like a Major League Baseball player trying to avoid a tag at home than an Olympic runner as she launched her body at the finish line in the 400 meters, diving to edge Allyson Felix for the gold medal.